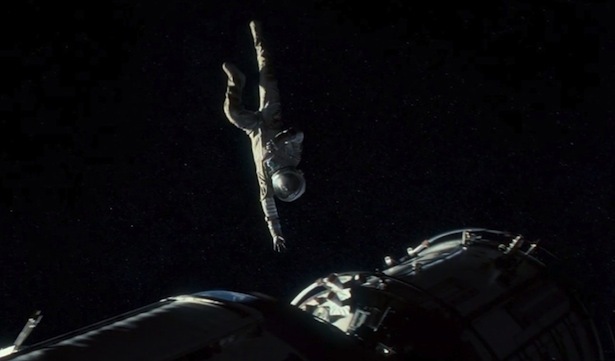 Movie Review: Gravity- Cuaron’s Purely Physical Immersion into the Nightmarish Beauty that is the Emptyness of Space is a Grand Cinematic Achievement | Generation Film! If cinema’s ultimate goal is to be an all-encompassing visual exploration into a world that is completely unknown yet anchored down in an equally familiar presentation of emotional and physical connectivity then Alfonso Cuaron’s latest science-fiction survivalist adventure Gravity is nothing short of sheer cinematic perfection. Known for his moody approach to storytelling made familiar through the bleak post-apocalyptic environment of Children of Men, the introduction to darkness in the Harry Potter series with The Prisoner of Azkaban, and the melancholy eroticism of Y Tu Mama Tambien, Cuaron has proven already that he’s a masterful storyteller with insight to spare. With Gravity it appears that Cuaron, in collaboration with his son Jonas on the screenplay, has sought to bring an unprecedented realism to the vacuum experience of space using the limitless technological advancements of the digital age with meticulous purpose and creative elegance. Every technical element from Emmanuel Lubezki’s graceful cinematography to the remarkable muted absence sound design keeps you encapsulated in a weightless suspension creating a one of a kind experience that captures numerous contradictory positive and negative polarities that includes terrifying beauty, nightmarish elegance, and haunting sentimentality. Though comparisons to Stanley Kubrick’s masterpiece 2001: A Space Odyssey will be warranted and deserved, Gravity is actually the exploration of space on the opposite extreme where 2001: A Space Odyssey used the expansiveness of space and time as a template for the mind while Gravity is the pure physical experience of body where the dichotomy of an infinite space becomes a beautiful yet frightful immersion into desolate isolation and intimate confrontation. Cuaron has delivered a remarkable cinematic achievement that embraces sensationalism on an exploratory level reminding us that in this digital age true artists can utilize visual effects and design for purposes beyond cheap ploys for brainless entertainment. Gravity might not have the sort of complex characterization of Cuaron’s previous films or the thought-provoking challenges he usually seeks to invoke, but that’s because the film’s intention is to be something far grander in embodying a physical experience and delivers a magnificently breathless thriller through its mastery of direction, technical opportunity, and emotional connectivity. More detailed review coming soon.